Imagine one of your students comes to your office door. 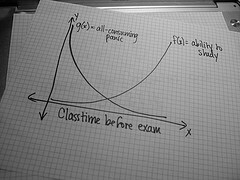 It’s just before their midterm examination, and full of anxiety the student claims to have studied the wrong material. As the instructor do we have any responsibility in this situation? I believe as instructors, one of our responsibilities is to teach in a manner that promotes effective learning practices that will support a student in a cram scenario. As such, the instructor provides students with all the necessary tools to facilitate higher academic achievement. There is substantial evidence that motivated students who incorporate effective learning practices or study strategies into their learning process demonstrate improved academic achievement. Some students have developed strong learning practices, while others struggle. Often students do not realize that effort does not equate with better grades. While we cannot force students to take a study skills course, as instructors we can promote efficient and effective learning in our students through intelligent course and lecture design. Students who successfully cram are able to use a concept map or course outline to narrow into relevant themes. They quickly search through their lecture notes and effectively identify lesson summaries or review sections. Additionally, they spot key headings, zoom in on important bolded or highlighted words, and trigger visual recall from graphs or diagrams. Instructors need to emphasize the benefit of learning practices and provide the resources needed by students to Study Smarter Not Harder! A skilled student tends to incorporate learning practices throughout the course, and rarely requires last minute cramming. Nevertheless, that student at your office door can be given clear instructions on how to cram by being directed to their effectively and efficiently designed course and lecture materials.